in Reports & Whitepapers with tags voice marketing playbook, voice technology Both comments and trackbacks are closed. 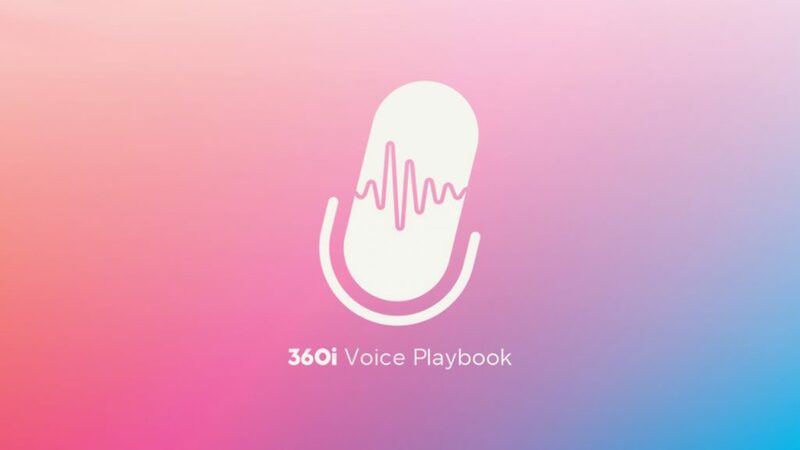 Today, we’re excited to release 360i’s Voice Playbook – an actionable guide for marketers that shares our collective learnings from over a year of exploring and executing for Voice. The Voice Playbook covers everything from staffing for a Voice team to skill discoverability and the nuts and bolts of Voice production. Download your free copy now. Voice has been an uncharted territory for marketers. In fact, 69% of marketers believe Voice is not the “next big thing”. As 360i CEO Jared Belsky writes in his foreword, “Our industry constantly confuses revolution for evolution. So there is no confusion, Voice will be a revolution and this playbook should be an instrument to help you navigate it.” As a communications channel, Voice will affect every single aspect of the marketing ecosystem, from Search and Production to eCommerce and Data Science. 360i’s VSM (Voice Search Monitor) research reveals that the AI algorithms behind the market’s leading Voice technologies are only getting smarter, and they’re pulling in data from all possible sources. The available knowledge pool is filling, fast. If you’re a marketer, the time to dive in is now. Don’t wait for the “Year of Voice”. It’s already here. You can download the full Voice Playbook here. For more information, email Voice.Playbook@360i.com.